There were two friends, and together they travelled the cosmos. They thwarted tyrants and defeated monsters, they righted wrongs wherever they went. They explored the distant future and the distant past, new worlds and galaxies, places beyond imagining. in the suffocating, unfeeling, deafening brightness. Once upon a time. Far, far away. I sat there, looking at the white screen of an open Word document. By this point, I would have written something. The summary and cast/crew details taken directly from Big Finish’s web site, a few sentences cribbed from the notes I took while listening to the story, maybe even a paragraph or two hitting some of the main points. And on those rare occasions, after the passage of 60 minutes I might actually be revising my first draft. But at that moment, the open document has been nothing but a blank electronic canvas. As I stared at the screen, trying to figure how in the hell to describe the strangest Doctor Who audio since The Holy Terror, I noticed that the more I looked at the screen, the more I noticed everything else. The sound of lawnmowers outside as my neighbors cut their lawns. The tapping of my fingers against the plastic mouse pad. The gentle and rhythmic breathing of my cat, Remy, as he slept on the bed next to my desk. All standard distractions one would notice as they tried to focus on a task, because that’s how our brains screw with us. The more we try to buckle down and do something, the more we become easily distracted. How many times has someone opened up Google, intent on looking up on thing, and finds themselves two hours later wondering why they’re looking at Wikipedia’s entry on “Roman Roads” and not quite remembering how they ended up with seven browser tabs open? As I kept staring at the screen, the physical stimuli started to fade away, and my thoughts took over. Thoughts that covered everything BUT the topic at hand. That embarrassing thing that happened to me in the 7th grade. A commercial from when I lived in Pittsburgh where a guy thought “I need to change my oil” every other sentence. Billie Piper’s horrible Irish accent from Penny Dreadful. Billie Piper’s incredible rack from Penny Dreadful. Reorganizing my closet. The upcoming week at work. Finding a new job. My current job making me miserable. My desire for less stress. My need to find my passion in life. What happens when someone doesn’t have a passion? Is life without passion even a life? Is life without any sort of sensation even a life? When my fiancée tapped me on the shoulder, I realized that an hour had passed. Time had completely slipped away from me. The lawnmowers had gone quiet. Remy had slipped from the bed and was now sleeping on the desk between my right arm and the wall. And I still had no idea how to approach this review. Scherzo is, without a doubt, one of the most unique and imaginative stories that Big Finish has ever published. It’s also one of the strangest, weirdest, and flat out bizarre tales as well. 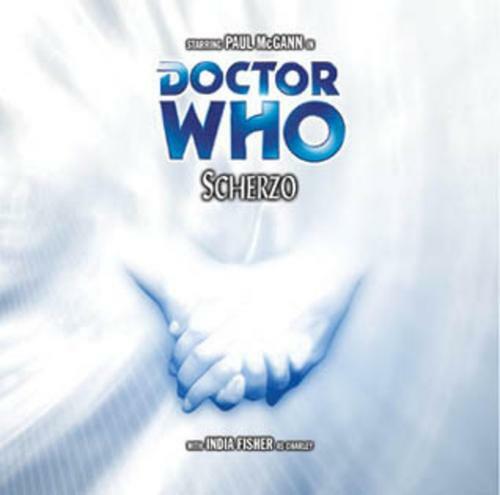 With a script by none other than Robert Sherman that features Paul McGann and India Fisher, and ONLY Paul McGann and India Fisher, Scherzo kicks off the Divergent Universe storyline by introducing the alien universe in a grand and unnerving fashion. At the end of Zagreus, the Doctor realizes that he is infected with anti-time and is therefore a danger to all of reality. 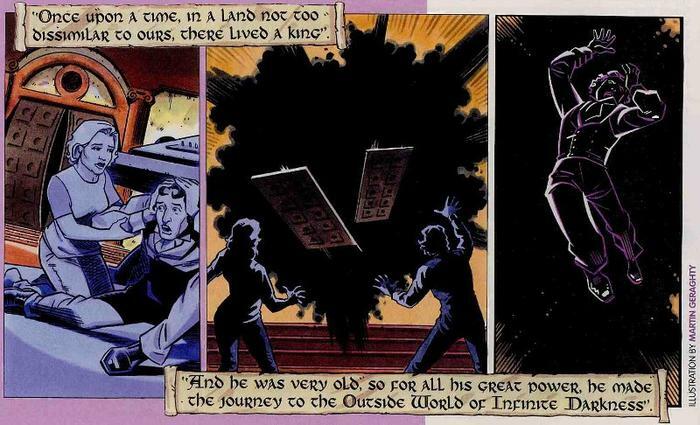 His only choice is to step into a new universe, one where time and therefore the Time Lords do not exist. He sends Charley away, unwilling to put her in danger, but Charley refuses to abandon him, sneaking back into the TARDIS before it disappears from our universe. When she finally reveals herself to the Doctor, he’s doing something incredibly unexpected; cowering in fear behind the center console. There’s nothing outside the TARDIS door, he says, nothing at all. The nothingness is seeping into the TARDIS, slowly erasing it from reality, as a universe without time has no need for a time machine. Charley pulls him out of the TARDIS at the last moment. It dematerializes behind them, leaving the pair alone. The pair find themselves under a white light, a light so bright that their eyes refuse to adjust. As they slowly make their way forward, they find that their other senses are beginning to fade; sight, smell, taste, touch, even hearing. Alone, with only each other for company, they push forward, hoping to somehow find someone or something that could free them from their sensationless prison. What they find, however, is beyond all the laws of nature and physics! The Holy Terror. Jubilee. The Chimes of Midnight. The stories that Robert Shearman has penned for Big Finish are among the best the company has published, true classics of the audio medium. In those stories, Shearman has shown an incredible knack for twisting perceptions and turning expectations firmly on their ear. Scherzo is no different. The story is a “two-hander,” a presentation with only two characters. The story has no varied voice cast, no musical score, no use of sound effects to establish setting. It’s only Paul McGann, India Fisher, and a faint buzzing noise that sits in the background the entire time, a gentle assault on the listener’s ears until the point where they realize they have been ignoring it for minutes on end. The Divergent Universe is not our own, and Shearman makes that abundantly clear very early. The Doctor can no longer detect the passage of time, and is forced to perceive it as humans do; a fleeting sensation that passes, never to return. Charley finds that, in the absence of stimuli, her brain fills in the gaps, with the smell of fruitcake or the sensation of holding the Doctor’s hand when she realizes that in reality, she stopped being able to feel it some time ago…and “some time” is a few hours to her and the better part of a week according to the Doctor counting his own heartbeats. Shearman’s script removes anything that could be used to establish anything other than complete sensory deprivation, save for the wrap around narration for each episode. McGann opens each of the four parts by weaving the tale of a king who banished music from his kingdom, only for the music to return in the most horrifying manner. Shearman’s lays it all out, without the bloated descriptions and McGann’s solitary exposition-filled monologues that plagued Zagreus. It’s up to the listener to fill in the gaps and imagine their own view of Scherzo, which is rendered very difficult by the lack of anything to base their visualization on. Think about the situations I’ve listed above. Imagine you’re Gary Russell, head producer for Big Finish, and Robert Shearman hands you the script for Scherzo with no music, no other characters, semi-cannibalism, and body merging on a David Cronenberg type level. Imagine that you have to take this script to Paul McGann and India Fisher and pitch it to them. And imagine the pair agreeing to do this story WITHOUT hesitation. That’s how great of a script it is. Scherzo might have a great script, but a “two-hander” depends on the performances of its pair of cast members. The bizarre situations and disturbing imagery is the most memorable part of the audio, but the bulk of the story focuses on the relationship between the Doctor and Charlotte Pollard. Removed of everything else, the characters have nothing to focus on but each other. Considering the absolutely alien conditions and acts they endure over the course of the story, it would be very easy for McGann and Fisher to either go completely over the top or sleepwalk through their parts. Instead, the pair play everything that happens to them completely and utterly straight. No “wink wink” moments or tongue-in-cheek comments about the absurdity of it all, just shock and then acceptance of what’s happening to them. The moments of levity are few and far between, leading to some of the finest performances by the pair since they began working with Big Finish. To me, the Doctor has always loved his companions, he just wasn’t allowed to say it thanks to BBC restrictions on just how “close” the Doctor and his companions could be. The Fifth Doctor, by executive fiat, wasn’t allowed to touch Nyssa or Tegan in case viewers got the wrong idea (Of course, the Doctor touched Turlough a lot, but I’m not getting into THAT discussion). But through the history of the show, you had Two/Jamie, Three/Jo, Four/Sarah Jane, Four/Romana, Six/his coat, and Seven/Ace. There were never any declarations or overt hints of physical affection, but viewers couldn’t deny that the Doctor would do anything for his companions and vice versa. Removed of all sensation, with only their thoughts to focus on, the topic of the declaration of love comes up…and the Doctor’s response is harsh. A bit harsh, considering Eight’s stereotype as the “romantic” Doctor, as he tells Charley “alright, we love each other. Now what?” Some people found that moment very off putting and out of character for the Doctor, but for me, it made perfect sense . The Doctor has loved before, but not in the same way Charley (or humans in general) have. Everyone leaves him, eventually, by choice, by necessity, by death. He’s sacrificed himself to save Jamie and Zoe, to save Peri, and he thought he sacrificed himself to save Charley…who instead threw herself back into danger, rendering his noble sacrifice null and void as they find themselves in a null void. Deprived of his “happy” ending, deprived of his temporal sense, it’s no wonder that the Doctor, when forced to consider his love for Charley, lashes out as he does. McGann does a great job selling these moments, coming off with a vibe of “I don’t want to say these things, but they need to be said.” And India Fisher comes right back, not whining, but not understanding. Again, her concept of “love” is difference from the Doctor’s, and she thought she was helping her friend, who she loved, not be alone in a strange new universe. Charley loves the Doctor, but was it love brought about from traveling together or love brought about from the tension and stress of Neverland? Shearman, McGann, and Fisher aren’t afraid to face the concept of love head on, leaving the question unanswered as they continue to plow ahead through this strange white world. The climax of the story touches on this concept of “love” again, but in a different way. The Doctor, in solving the puzzle of their situation, realizes that this is a brand new universe, and that as a Time Lord he is capable of becoming the entire universe, changing it with just a thought if he continues to evolve like the creature they continually encountered. But it’s Charley who pulls him back from the brink of becoming the proverbial “Time Lord Victorious.” As they head out into the Divergent Universe, trying to see if the TARDIS has survived, the central point of Scherzo hits home. At the beginning of the story, the Doctor was willing to let the darkness embrace him until Charley pulled him free. In the middle of the story, Charley was willing to adapt to their new situation until the Doctor forced her to face reality. And the end of the story, Charley needed to pull him back from the brink, from becoming something akin to the Valeyard on a universal scale. Scherzo is weird, it’s horrifying, it’s visceral, it’s brutal, and it’s honest. In the end, the Doctor requires a companion to keep him grounded, to keep him from becoming the type of Time Lord he fled Gallifrey to avoid. The Doctor needs Charley to be a better man. To Robert Shearman, that is the true definition of love. Synopsis – Easily the strangest and bizarre story from Big Finish, Scherzo introduces the Divergent Universe by robbing the Doctor and Charley of everything they know, including their senses, and forcing them to confront the true nature of both their friendship and their individual lives. 5/5. Paul McGann is the Doctor in…The Creed of the Kromon. This entry was posted in Big Finish Review and tagged 5/5, Big Finish, Big Finish Audio, Big Finish Review, Charley Pollard, Doctor Who, Doctor Who Audio, Doctor Who Review, Eighth Doctor, India Fisher, paul mcgann, Robert Shearman. Bookmark the permalink.